I’ve known Longbottom for 20 years, and seen him in difficult situations before. But none as traumatic - or witnessed at such close quarters - as this. From my vantage point, had I wanted to add to my friend’s difficulties, I could have thrown a rock down to his exact location. It was all unfolding just 100 feet below me, but it was like watching a mate being tied to the tracks as the train came bearing down on him. I wasn’t the only one watching helplessly, either. Alongside me at the fort at Nazaré, the infamous Portuguese big wave surfing spot, and lined up along the cliffs, were thousands of surf fans and tourists. Meanwhile, the WSL, surfing’s governing body, were broadcasting the session to a worldwide audience. Two days prior, the ‘Nazaré Challenge’ big-wave surfing competition had been held here, and with even more giant surf forecast, the broadcast team had been kept in place to capture a potentially historic “free surfing” (ie. non-competitive) session on the Sunday. After being held underwater for 30 seconds, Longbottom surfaced perilously close to the giant rocks that line the cliff. If it wasn’t for the bravery of a jet ski driver who rescued him, he probably wouldn’t have survived. He later described the experience as the closest he had ever come to dying in the ocean. Longbottom is far from the first person to have nearly died at Nazaré. In 2014, Brazilian surfer Maya Gabeira had to be rescued after she was found floating unconscious face down after a wipeout. CPR, performed on the beach by her surfing partner Carlos Burle, saved her life. The following winter season (when the waves are biggest), she would return to surf it,and last year, she claimed the Guinness World Record for the biggest wave ever surfed by a woman - registered at 68-feet high. But the close-shaves have continued at Nazaré. In 2017, British surfer Tom Butler pierced his lung and almost drowned. Andrew Cotton, a Nazaré veteran, broke his back in a horrific fall last year. It was a fair assumption to make. After all, the inhabitants of this historic fishing village, located around 80 miles north of Lisbon, are well aware of the unique power of the ocean. The colourful and narrow curved prows of their wooden fishing boats are a direct link to the first fishermen of the area; the Phoenicians, who settled here in pre-Christian times. Every generation since then has endured the loss of loved ones taken by the Atlantic. So when they saw McNamara first paddling out to surf waves that were almost as high as the towering cliffs they crashed into, they were certain he had a death wish. What they didn’t know is that McNamara, a well-known big wave surfer, had previous experience with waves like this. Nazaré had been surfed since the early 1960s, but never when the waves were huge. Then, nearly ten years ago, a local sent an email with a picture of the wave to Garrett. The local knew the waves were huge, having watched them all his life, but without any human to put a scale to it, didn’t know just how truly big they were. He figured Garrett might be that human. In the early years, Garrett would sample the magic alone - as Nicole watched on alone from the fort. However, word soon starting getting out of his exploits. McNamara was joined by a small group of fellow big wave enthusiasts, such as the UK’s Andrew Cotton, Germany’s Sebastian Stuednter, and local fisherman Hugo Vao. That first winter, McNamara was towed into a wave that was later to be judged 78 feet high - a new world record. Suddenly, Nazaré was very much on the surfing radar. By this point, the McNamaras were returning each winter, when the waves are biggest, and setting down roots. They were married in the town, and on that year’s live broadcast from Nazaré, Garrett explained (perhaps with a little too much detail) how his two children were conceived on the beach. Then, in 2013, Hawaiian big wave legend, Shane Dorian, arrived for the first serious attempt at paddling into waves at the break. The sheer scope of the wave, and its random beachbreak nature, had meant that many thought the only way to surf the wave was with jet ski assistance. Dorian’s efforts, however, opened a new way of approaching the monster. “Nazaré was so scary, but it had everything. It was super-intense, super-technical, big, gnarly, spooky; you know all things I loved about big wave surfing,” Shane Dorian recalls. “At the time I said there’s every chance of someone paddling into a 100-foot wave out there. 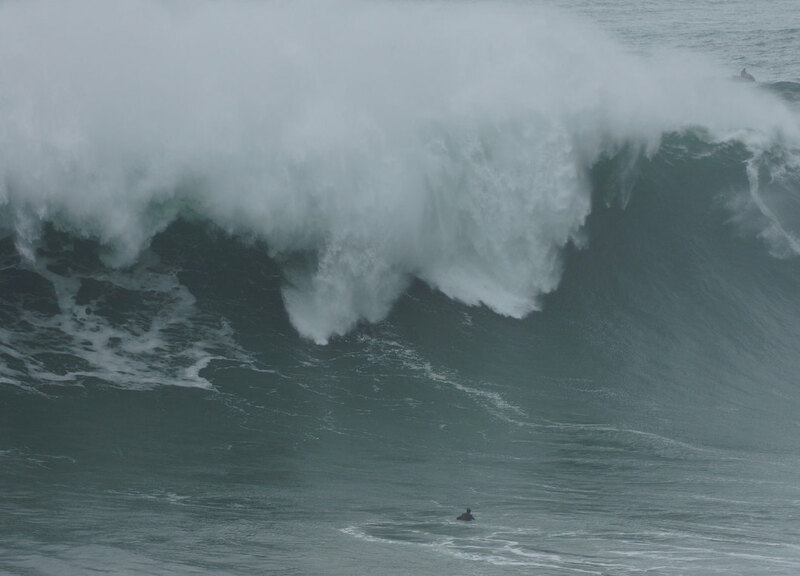 Having watched the Nazaré Challenge last Friday, I’m even more convinced.” The current record currently stands at 80-feet, for a wave ridden by Brazilian Rodrigo Koxa in November 2017. Chicharro has overseen the transformation of the fort, which was closed to the public for centuries, into a big wave surfing museum. In 2017, McNamara became the only foreigner to receive the Vasco de Gama Medal of Honour from the Portuguese Navy for his contribution to Portugal. The local harbour, where fisherman have been operating for centuries, is now the world’s most advanced big wave storage and launching facility. Companies like Mercedes Benz and Red Bull have sponsored dedicated hangers where surfers store their specialised, expensive surfboards and jet skis. The town also provided state of the art training and fitness facilities for the athletes. Accommodation lodges like Zulla have sprung up, offering modern stylish apartments with a surf camp vibe that is only a short walk to the famous wave. The town, once a summer-only resort, now thrives all year round. Ben Mondy is a writer and WSL commentator based in London.